I was at Sunshine Train Station today. If you haven’t been to Sunshine… well, good for you. It’s the most ironically named suburb in Melbourne. 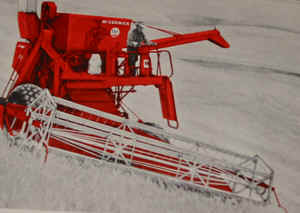 Actually, Sunshine’s not even named after that stuff from the sky, but for a company that made combine harvesters. It just gets better, doesn’t it? You may have seen the station in the film Noise. A train pulls into Sunshine, it’s passengers brutally murdered by a lunatic – if you’ve been there, you’ve probably had the urge to do that yourself. My train to the city arrives, but the recorded woman isn’t well. Something strange has happened to her speaker, she now sounds surprisingly like the Borg. “You will be assimilated. Next stop, Footscray”. A young man in a hoodie across from me is doing something distracting with his hands. Is he shooting up? No, he’s juggling a glass sphere, just like David Bowie in Labyrinth. He’s actually pretty good. If there was a David-Bowie-In-Labyrinth lookalike contest, he could definitely make the top three. Southern Cross Station is coming up – when I returned to Melbourne after living in London, I originally misheard this as “Southern Crustacean”. Now I can’t shake this suspicion that Spencer Street Station was actually swallowed whole by an enormous southern crustacean. I look out the window as we approach and I can see its silver scales shining – are we also to be consumed by the southern crustacean? Are we a snack, mere krill to this silver behemoth? The train plunges into the metal maw, the train into darkness. 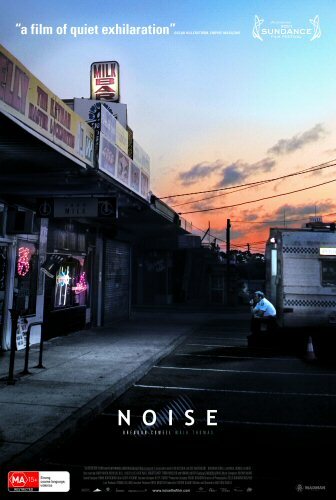 Easily the best Australian film of 2007 – if not the last decade – Noise is a character study of a lowly cop (Brendan Cowell), who has to staff a police information van in Sunshine. Sophisticated, moving and unexpectedly funny, Noise is not a great ad for Sunshine. Or the Victorian Police Force. At the end of the superb Ghosts Of The Civil Dead (1988), David Field goes from being a petty criminal to a truly scary individual. On an escalator. And there’s no scarier escalators than Parliament. The station also turns up in the less-superb Queen Of The Damned (2002) and Let’s Get Skase (2001), where a character emerges from Parliament station to find himself in King’s Park. In Perth. It’s an odd moment. The Big Daddy of Melbourne Train Stations. Five years to build, from 1905 to 1910! 110,000 people pass through it’s turnstiles every day! Platform 1 is the fourth longest railway platform in the world! There’s a ballroom upstairs! It’s made entirely of cheese and magic pixie dust! People once worshipped it as a god! 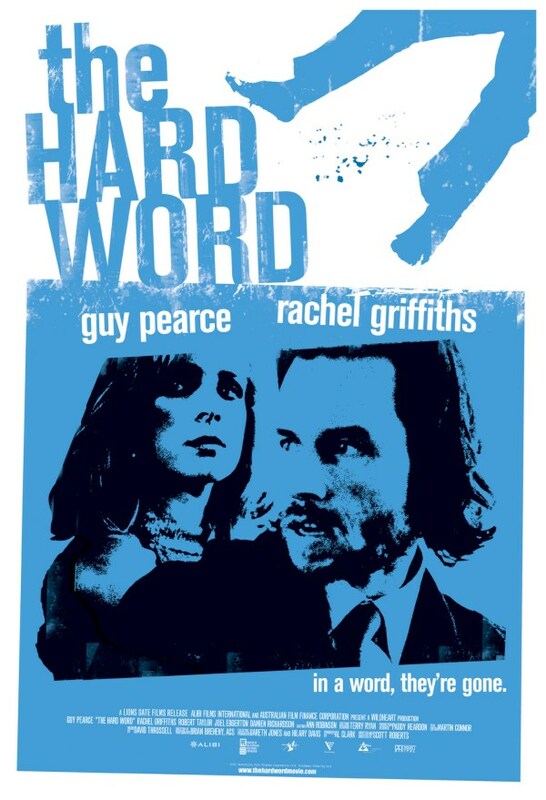 The underrated The Hard Word (2002) features a great chase scene that starts at the World Trade Centre, runs up Spencer Street and ends with Guy Pearce, Joel Edgerton and Damien Richardson jumping off the Bourke Street pedestrian bridge onto a moving train, all to a David Thrussell soundtrack. And can I find a clip online? Can I, buckleys. This entry was posted on Friday, August 8th, 2008 at 12:25 am and is filed under film, street-life. You can follow any responses to this entry through the RSS 2.0 feed. You can leave a response, or trackback from your own site. Parliament is a scary escalator. You must watch Jackie Chan’s Mr Nice Guy, if only to see the impossible logistics of running into Parliament station and running out Melbourne Central. Although it been a long time since I’ve seen it it’s always great seeing Melbourne trams feature in ludicrous action sequences. Noise is brilliant you are right, apart from Brendan Cowell playing himself. I couldn’t remember if you saw Melbourne Central Station in Mr Nice Guy or not. My favourite Melbourne moment in that film is when someone asks if he can make it from Chinatown to Melbourne Central in 20 minutes, trying to pretend they’re not just next to each other. I believe Flagstaff appears in the new Nicholas Cage movie, with terrified people streaming out of it, but haven’t confirmed that yet. And I seem to recall Richmond playing itself in Say A Little Prayer but no-one in the world seems to remember that movie. “Insert filthy joke about Brendan Cowell playing with himself here”. 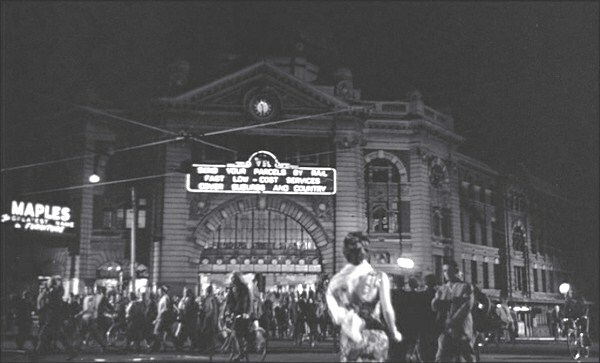 Jackie Chan also filmed at Flinders St station at the entrance to the tunnel that connects Flinders St/Elizabeth St with the bridge to Southbank (does it have a name?). He filmed on the river side. I know this because he almost walked into to me as I was trying desperately to look as if I wasn’t stalking him and the crew during the filming. It was fascinating to watch them making what turned out to be such a crap film. Sammo Hung not firing on all cylinders there. But what the heck, I got their autographs! Fangirls of the world unite! I guess Geelong train station doesnt count as it is actually in, um, Geelong. But we used that one in The Home Song Stories, if anyone cares. Was Geelong train station playing Geelong, or was it playing a Melbourne station? I can’t remember a train station at all in Home Song Stories – was that before or after the scene where the giant robots battle the zombies while Kelly Holmes calls on the mystic forces of the dolphins to save mankind? It was actually playing a train station in Melbourne. i think. I can’t believe you don’t remember the scene. It’s the one where Joan Chen diffuses the bomb that will go off if the refreshment trolley goes over 2 km an hour. It’s gripping stuff. Oh! And I just remembered that when i was an extra on ‘Knowing’, we were all rioting at Parliment Station, which was pretending to be a Boston subway station. Why were we rioting? It’s the end of the world, what else is there to do?